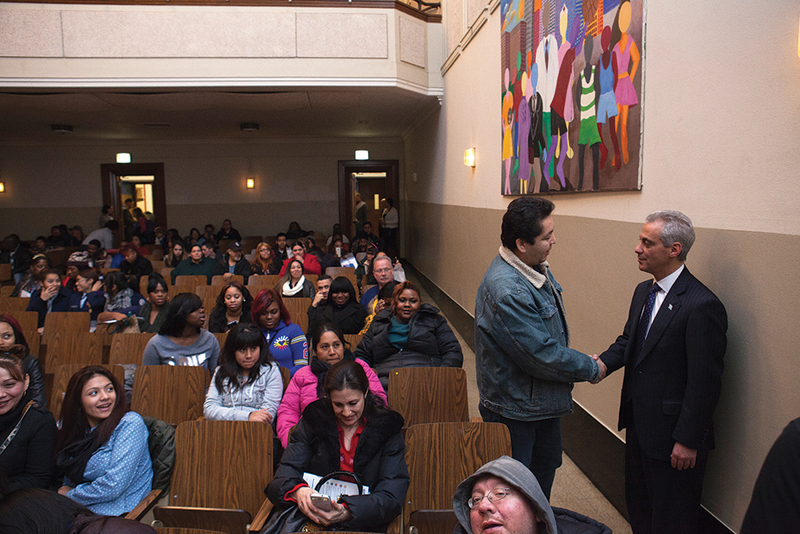 Mayor Rahm Emanuel greets parent Sergio Ruiz at a Chicago Star Scholarship information session held at Wells Community Academy High School in December. The scholarship provides tuition, fees and book waivers to qualifying CPS graduates. Speaking in Spanish before a group of high-achieving students and their parents, Luis Narvaez made a simple acknowledgement after explaining how they could get free tuition at one of the city’s community colleges. Since City Colleges began taking applications for a plan widely advertised as “free college” by a campaigning Mayor Rahm Emanuel, more than 1,000 students have applied for the offer of waived tuition, books and school fees. 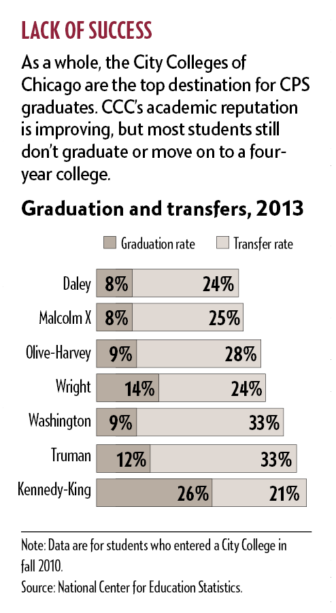 The idea sounds good, given that City Colleges remains the top post-secondary destination for CPS graduates. And the plan got a publicity boost from President Barack Obama, who said it inspired his own proposal to offer free community college on a national basis for high school graduates who can maintain a 2.5 GPA in college. The president’s proposal also borrows from the Tennessee Promise, an offer of free tuition at community college for all high school graduates in that state. The Chicago plan, however, has some important caveats. For one, the Chicago Star Scholarship only kicks in after federal grants and financial aid are applied to tuition and fees. That leaves a small pool of young people to potentially benefit: According to City Colleges, the majority of qualifying students would get federal and state aid, which typically covers all costs. Second, students who meet the scholarship requirements — including a 3.0 grade-point average and placement into college-level math and English courses — aren’t the typical demographic at City Colleges, where 90 percent of incoming freshmen need to take remedial courses. In fact, higher-achieving students have traditionally avoided City Colleges, and research shows that the school’s relatively poor outcomes — low graduation rates, low transfer rates to four-year colleges — have a more detrimental impact on better students. Goldrick-Rab co-authored a report last year that showed that CPS graduates who had the academic background to attend a selective four-year college but instead enrolled in a City College were 31 to 41 percentage points less likely to earn a bachelor’s degree within six years than similar students who opted to attend a four-year school instead. The study was published in the journal Sociological Science. City College officials don’t buy the implications. In a statement, officials said they “don’t believe at all” that high-achievers will fare worse at a City College. Spokeswoman Nikole Muzzy stressed the financial advantages. The average cost of a two-year degree at a City College, including tuition, fees and books, is about $8,000. But just seven percent of CPS students who enroll in a two-year college ultimately earn a bachelor’s degree, according to a recent study from the University of Chicago Consortium on Chicago School Research. As part of its “Reinvention” effort to improve City College programs and practices, the administration has doubled the number of advisers available to meet with students on what courses they should take, Muzzy says, and added “transfer centers” to help students apply to four-year programs. Despite the concerns, city and CPS officials say the Chicago Star Scholarship would provide at least one option for an estimated 1,500 graduates who would meet the requirements but would otherwise not be likely to enroll in any college. CPS officials declined to provide details on the students they say fit the profile of potential scholarship recipients. According to Holsapple, the data he has looked at indicates they generally come from high schools in low-income neighborhoods with low graduation rates. Dozens of undocumented students and their parents attended the session at Wells, where district and college officials even offered a special workshop to answer their specific questions. Guadalupe Cruz, a senior at Amundsen High School on the North Side, and her parents were among them. The family is from Mexico and is undocumented. Cruz says she’ll likely take advantage of the Star Scholarship to take courses toward a degree in social work. But, without federal aid, she doesn’t yet know how she could pay the costs to transfer into a four-year college. Because she was brought to the U.S. illegally as a child, Cruz, who is now 18, qualified for deferred action last year. The deferred action policy, known as DACA, gives young immigrants two-year renewable work permits and exemptions from immigration enforcement. However, it is no permanent guarantee for immigrants like Cruz. “The idea of finishing school and not being able to do anything scares me,” Cruz admits, voicing a fear shared by many undocumented students. Still, not everyone at the session had the same concerns. Lucia De Leon, a program assistant at Austin Polytechnical Academy, brought a half- dozen students to the session. The students likely won’t qualify for the Star Scholarship; most will probably be able to get Pell grants and might need remedial coursework. But De Leon believed the information session might pique their interest in college overall — and show them that City Colleges could be a good place to start. City Colleges’ reputation has improved since she attended Wright College herself, she said.